National Escargot Day is celebrated annually on May 24. If you've never had this dish, today you've got a great reason to try. Escargot is French for snail. Boiled and baked escargots are very good with a rich butter sauce, but, of course, it's the matter of taste. This dish is usually served in French restaurants as an appetizer. Vineyard snails are considered as the best eating, but they are very difficult and long to grow. Snails do not grow fast, that is why they are so expensive. Another variety of snails used for eating, is the French petit-gris, that grows about 1 inch. This escargot is also grown in the United States. You can find fresh snails in speciality markets all year long. If you don't want to cook alive snails, then you can buy canned or frozen snail shells, that are available in supermarkets. Escargot is a healthy dish. 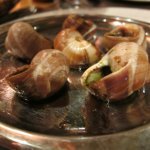 The flesh of snails is high in protein and low in fat, if it's served without the butter. Anyway, cheese, garlic, butter and wine make snails taste much better.